Experience one of the scariest, most highly acclaimed games of 2017 with Resident Evil 7 Gold Edition - complete with all Season Pass content. As Ethan Winters, explore the seemingly abandoned Baker mansion and uncover the truth behind the disappearance of your wife. 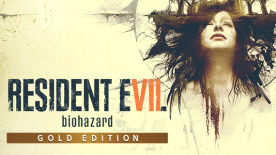 The Gold Edition contains the full game plus DLC: the Banned Footage Vol. 1 and 2, and the End of Zoe epilogue episode. Also available as a free download to all RE7 owners is the 'Not a Hero' epilogue chapter starring Chris Redfield.